Bob Dylan: songwriter, singer, poet, artist, sculptor, filmmaker, Nobel Laureate – a titan of contemporary culture. 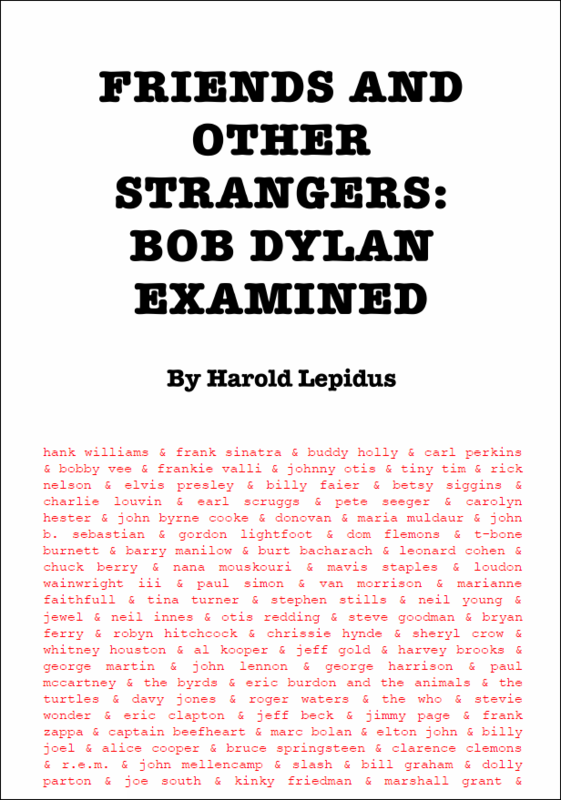 Friends and Other Strangers: Bob Dylan Examined is a collection of more than 120 articles offering an informative and entertaining look at the people who have influenced, been influenced by, or simply hung around in Bob Dylan’s orbit at one point or another. From 2009 to 2016, Harold Lepidus wrote 1000-plus articles for the no longer available Bob Dylan Examiner column – a go-to resource that was viewed millions of times and referenced by Rolling Stone, npr.org, Paste, Ultimate Classic Guide, Wolfgang’s Vault, Uncut, Glide, and American Songwriter, amongst others. Lepidus broke many a story about Dylan, in addition to analyzing his art with a trenchant and astute perspective. This curated anthology features Lepidus’ most pertinent articles and focuses on the unique perspectives of people associated with Dylan, from Buddy Holly to the Beastie Boys, Leonard Cohen to Barry Manilow, President John F. Kennedy to Tiny Tim, Johnny Otis to Otis Redding. Also included in the book are interviews conducted with Dylan associates, including filmmaker D.A. Pennebaker, musicians John B. Sebastian, Harvey Brooks, Carolyn Hester, Harvey Mandel, John Byrne Cooke, Dom Flemons, and Robyn Hitchcock, Dylan scholars Michael Gray and Sean Wilentz, and others. For connoisseurs of Bob Dylan, Friends and Other Strangers is a must-have in any collection. Book Categories: Biography and Music.